When I heard the English edition of Paco Torreblanca: The Book was out, I developed what can only be described as a fixation. W very generously offered to buy me a copy, possibly in part to stem my incessant babbling about the book, the man, and his sweet works of edible art (see here for all the news) - in case anyone's wondering, I am well aware that I am an outrageously lucky girl. Since it arrived, my every waking moment has been consumed by visions of isomalt bells and the hydroscopic properties of trimoline/invert sugar (useful for everything from preventing crystallization and lowering the freezing point of ice-cream to stabilizing the emulsion-suspension that is ganache and ensuring its extraordinarily smooth texture). If Spain is indeed the new restaurant frontier, it's also where the whole concept of dessert cuisine has really taken off. Pastry geeks need no introduction to hypermodern joints like Talaia and Espai Sucre or the celebrated It likes of Oriol Balaguer and Jordi Butrón or legends such as maestro heladero, Angelo Corvitto. But if there's one man who can be called the padre of the contemporary Spanish pastry scene, it's Francisco Torreblanca. As it's not a book written with the domestic kitchen in mind, you'll have to do the math where quantities are concerned, as well as read between the cheffy shorthand lines when following instructions - caveats that apply with any book of such a genre. Having got that out of the way, it's a page-turning read of incandescent ideas, headily mixing vibrant re-thinks of classics with searingly original creations. It's also a heartbreakingly handsome volume thanks to the photography of Francesc Guillamet (best known for his work on the elBulli books). 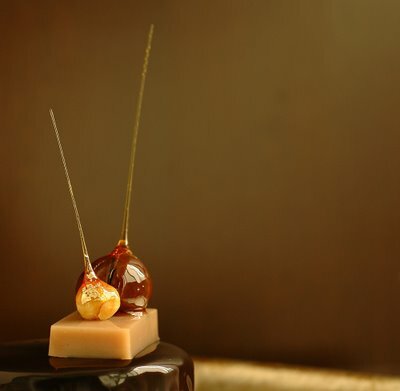 The search for balance, both in terms of flavour and aesthetic, informs many of the desserts. From the purity of line to the meticulous attention to detail, the creations often offer a glimpse of the chef's professed affinity for Japanese culture and sensibility. What's more, the tome is thoughtfully accompanied by a softcover book. Containing all the recipes as well as detailed construction diagrams, with laminated smear-proof pages, it's intended as a "working book" to be brought into the kitchen so you can keep the exquisite hardcover edition in pristine, un-besmirched condition - how considerate is that? Evidently, much to W's amusement/resignation, ownership has yet to forestall my chatty cathy repetitiveness. But enough already; the proof of the pudding is in the eating. Not that I know squat about kadō, but there's something about the linear construct of the Marronier that reminds of ikebana. A rich center of chestnut crème caramel sits between pillowy bavarois layers flavoured with chestnut, milk chocolate and rum, the whole supported by a disc of chestnut ladyfinger sponge. Once set, a dark chocolate glaze is applied. 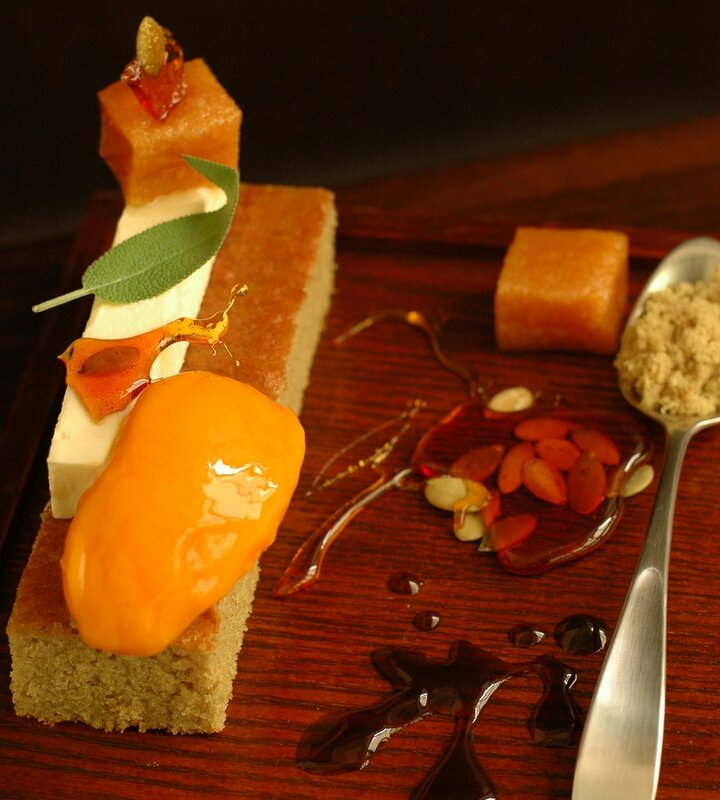 To finish, an ingot of crema de frutas de marron (chestnut cream paste), caramel-coated "stems" of chestnut and hazelnut, and a dab of gold leaf. I couldn't find sprigs of fennel blossoms to candy - the final touch - but I don't think the end result looks too shabby for it. Think pumpkin seed oil, olive oil, goat cheese, pumpkin, pumpkin seeds, apricots and balsamic vinegar - Have the myriad soup or salad or other small plate/antipasti/tapas/meze possibilities taken shape in your mind's eye? Dessert certainly didn't occur to me. Yet here it is, in the guise of pumpkin seed oil and olive oil sponge cake, goat's cheese mousse, pumpkin sorbet, pumpkin seed brittle, apricot cream paste (essentially a pate de fruit), "couscous" made by sauteing cake crumbs in butter, caramelized balsamic vinegar reduction...alone, each of these preparations may seem a bit eccentric, but on the same plate, they make perfect sense. As much sense as had the featured ingredients met a savoury fate. The contrast in textures and harmony of flavours make this unexpected combination work. It's also another study in balance, with each element subtly flavoured and not excessively sweet so the final impression is of order, not dissonance. I wish i was just 1/10000 as talented as you. I am a fan of chesnut so the first confection sounds so so good to me. PS W. must be happy with the investment! All one can say is Bravo. You are a master dessert chef! Lucky you indeed! I think it's fabulous that at least one copy of the book is in the ownership of someone who can do such perfect justice to it! The second dessert looks delectable! Your talents never fail to amaze me. Few of us are able to replicate the flavors of a cookbook recipe, much less presentations so dazzling and beautiful. Your blog is a constant source of inspiration. As you raise the bar, so must I.
I bow at your feet...What can I say except FABULOUS!! Now is that the cab company on the phone asking if you'd like a ride to International Plaza??? I come to your blog and I feel so humble but the exquisite work you produce. It inspires me to read more, practice more..I can only say thank you for sharing and inspiring. I have stumbled on your blog lately and can honestly say that this blog thing is all new to me. I am a professional chef not in the leagues of these spanish wizards but in my own right and I must say that I am truly impressed with your representation, especially for someone who's not have any professional training. also, I realized that there is quite a few of you guys out there who shares this passion for pastry and food. Hmmmm...who are you? dear god. i wish i was singaporean. it's funny how k.l. is so far away. i've been reading your blog for a long time already, but the menu for the last post just threw me into a state of ecstatic .. fervent ... gosh. you know you really should open a patisserie! All I can say is that you are undoubtedly the queen of desserts! Why you are not a pastry chef astounds me. O MY GOD - amazing!! have to have this book!!! Hi J, I feel like a broken record, but you are so amazing! How do you always manage to outdo yourself? I had actually never heard of Torreblanca before this post, but now I want the book too... You are one lucky girl indeed! In the meantime, can I place an order for some of that bizcocho de calabaza? What a brilliant idea! 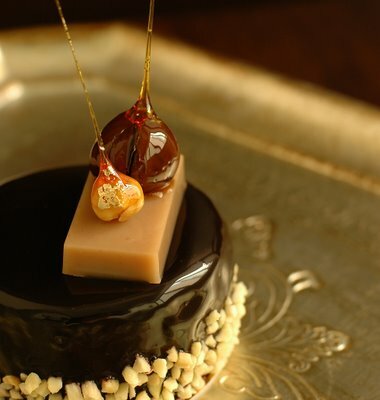 The sheen on the chocolate and the caramel makes me shiver -- your usual breathtaking work! I have to say, I don't really want to eat it, but I wouldn't mind gazing at it for a long, long time. Shame on me my english is too bad to tell how much j'adore! Once again I'm in awe! I am so thankful for you because you delve into the highest echelons of the pastry world so I don't have to. I have neither the knowledge or the patient dedication, so I love living vicariously through you. These are works of art, and I suspect they taste divine as well. Thanks for all the links; I want to learn more about these pastry masters from one of my favorite food countries. Beautiful, J, as always! Your dessert creations never fail to impress me! These two projects have left me speechless. I don't think I put as much work into an entire meal as you must have put into marronier - it is the embodiment of dessert perfection! And the intriguing combination of tastes and textures in the second dessert are beautifully illlustrated by your plating. Fabulous!